Please tell us about your studies and research here. Thao: I just finished my master’s degree, and have started working on my medical degree in the International Doctoral Program in Medical Sciences. I work in Kato-sensei’s lab, where the research focus is on transforming growth factor β (TGF-β) signaling and how it regulates human diseases, especially cancer. In my group, we are trying to find out the role that this plays in the progression of the disease. Thuy: I’m in the 1st year of doctoral program in Medical Science as well, and I also took my master’s degree here. I belong to the regenerative medicine and stem cell biology lab, where I’m interested in stem cells from adipose tissue. I hope to figure out some characteristics of adipose tissue-derived mesenchymal stem cells from diabetic patients. Then, I try to improve their functions and use them to treat diabetes mellitus and its complications. 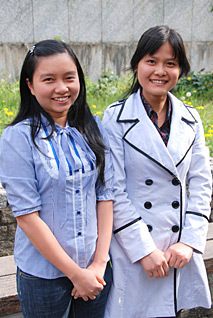 Thuy: It’s a very impressive place ; the people are very positive and helpful.. The students study very hard. In Tsukuba, there are many opportunities to learn about science. I have had the opportunities to join many conferences and met a lot of famous scientists from Japan and other countries. Besides, it’s very beautiful here. I love the seasons – my country only has sunny and rainy seasons. I enjoyed the snow in the winter, and all beautiful flowers, especially the sakura (cherry blossoms) in the spring, as well as the momiji (maple leaves) in the autumn. Thao: I love Tsukuba. It’s a modern city, not so crowded, quiet, lots of open spaces and fresh air. Moreover, it’s very convenient to get to Tokyo with a TX express train within 1 hour. So it’s a very suitable place for studying and living. The International Student Center, which is located in the center of Tsukuba University, also gives many supports for overseas students. Here, it is very easy to make friends, join international events, and learn about the cultures of other nations. Have you done much traveling? Thuy: Oh, yes, I go shopping in some places around Tsukuba every weekend. My friends and I often have gone on trips to Tokyo, Yokohama and Chiba. We also went to Hokkaido for the Snow Festival. Thao: I want to become a scientist in the near future. After graduation in two or three years, I’ll return to my country and set up my own lab. I am meeting lots of professors here, so in the future I hope to form tie-ups between Vietnam and Japan. Thuy: I hope to become an independent researcher, as well as a lecturer. I would like to contribute to develop my field of study in Vietnam, and convey my knowledge to students in my country. Educational background: Biology/ University of Science, Ho Chi Minh city, Vietnam. Educational background : 2006.8: Graduated from An Giang University, An Giang, Vietnam. 2007.9-2009.3: Studied in Master course of Human and Animal Physiology, University of Sciences, Ho Chi Minh city, Vietnam. 2009.4: Entered Dual Master program in Medical Sciences, University of Tsukuba Tsukuba, Japan. 2011.3: Graduated from Master program in Medical Sciences, University of Tsukuba Tsukuba, Japan. 2011.4: Entered Doctor program in Medical Sciences, University of Tsukuba Tsukuba, Japan.